Enjoy the glory of the Caribbean sunshine on the deck of this beautiful 44-foot sailing catamaran, now available for exclusive PRIVATE charters in Playa del Carmen for groups of up to 40 people. Free-flowing drinks, snorkeling, sailing and fun! You can do either a morning snorkeling cruise or an afternoon snorkeling and/or sunset cruise. We'll sail to the Great Mayan Reef and the Puerto Morelos Arrecife National Marine Park where we'll snorkel in the clear blue-green waters that make up the best snorkeling area in the Riviera Maya. This boat comes with everything just for you to enjoy the day as you wish. Get ready for an exclusive PRIVATE experience in Playa del Carmen that you won't forget! 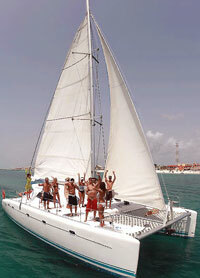 Sail with the wind on a beautiful 44-foot catamaran on the Caribbean Sea! Relax and enjoy cocktails from the all-you-can-drink open bar. Great snorkeling in the Puerto Morelos National Marine Park with amazing coral reefs and lots of tropical fish! Larger Group? Ask us for a Quote on a Larger Boat. When: Daily at 9:00 AM and 2:00 PM. Afternoon Tour Can Start Later if You Want to See the Sunset. Where: Near Puerto Morelos, about 30 minutes from downtown Playa del Carmen. Exact meeting instructions will accompany your confirmation. From Xcaret to Tulum to El Cid - $25.00 per person (minimum 4 pax). Optional: Add a 3-Course Lunch and 2 Drinks! Kids same price as adults. is great for a shore excursion.